For some applications such as trenching or running a rototiller, a lower ground speed was needed while still maintaining the higher pto speed. To accomplish this, some transmissions were made to install behind the tractor transmission rather than in front like the Sherman and Hupp. The Everett trencher transmission actually lengthened the tractor by a few inches when installed. The Everett transmission has such an extreme gear reduction at 98 to 1 that it’s only logical use can be for running the trencher unit. The photo below shows an Everett unit installed in Marvin Baumann’s 8N “Fourtrans”, the world’s slowest tractor. 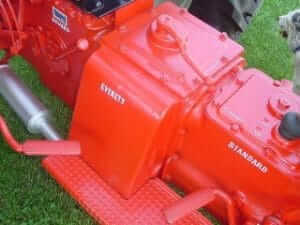 Marvin has four transmissions in his tractor, the Sherman creeper transmission, the standard transmission, the Everett trencher transmission, and the Howard gear reduction unit.